Explore a New Venue. Learn and Cast Spells. Discover the Magic of the Gothique Library Today! The Gothique Library is an all-new Venue for your Sims to explore, the Venue is now available exclusively at The Sims 3 Store. The hauntingly majestic library has twists, turns and surprises around every corner. What will your Sims discover when they explore this all-new venue? All-new interactions, all-new animations, all-new ways to play The Sims 3. Discover the Magic of the Gothique Library Today - Only at The Sims 3 Store! The Sims 3 Facebook reaches 6 million fans! The Sims 3's Facebook has reached 6 Million, check out how they are celebrating! I'm sure you will enjoy their surprise! 6 Million Fans on Facebook! The Sims 3’s official Facebook Page has reached over 6 milliion fans! Thank you all for your support! To celebrate, we’ve created this awesome greeting card for you to print and share with friends and loved ones. Can anyone spot Plum & Bob? Save the date for The Sims 3 Town Life Stuff live broadcast! Join The Sims 3 Producer – Jennifer Lane – at 10:30AM PST on July 8 as she introduces The Sims 3 Town Life Stuff! Learn how to revamp your Sims world with the latest The Sims 3 stuff! Build a new chic library, high-tech gym, sunny bungalow playground, or new state of the art Laundromat! The Sims 3 Town Life Stuff launches the week of July 25th worldwide. Take advantage of this opportunity to learn more about The Sims 3 Stuff Packs and to get up-close with Jennifer during the Q&A session where she’ll be answering questions from you! As a treat, we will be revealing a never-before-seen exclusive and some lucky fans may be randomly selected for goodies! We're celebrating The Sims 3's birthday all month! 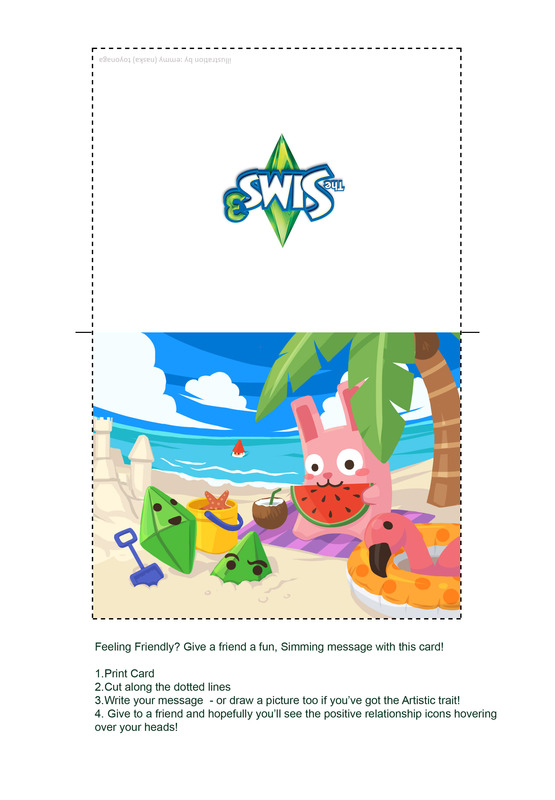 To celebrate The Sims 3's second birthday and the arrival of Summer, we've made this cool greeting card. Print this card, write a personal message, and give it to a friend. Update your neighborhood and your Sim’s style with items and venues for their house and town. The Sims Studio proudly announces The Sims 3 Town Life Stuff Pack, designed for you to update your neighborhood and spend the day around town, will be available on July 26, 2011. Does your Sim love books? Build them a library where they can mix and mingle with their neighbors (but remember to keep it down!) or add one of the new retro library sets to their home. If your Sim prefers to pump iron, then build them a state-of-the-art gym with treadmills, weight machines and more. For those Sims who are family oriented, create new playgrounds filled with a sandbox, slide, treehouse and other fun items. Additionally, with The Sims 3 Town Life Stuff Pack you’ll also get washer and driers for your home, new casual outfits and hairstyles to enhance your Sim’s look, as well as community lots like the Fresh and Frozen Express Grocer, Par Excellence Preparatory School and Scrupmtious Nibbles Café. The Sims 3 Town Life Stuff pack is currently available for pre-order at Origin – powered by EA. For more information on this title and all of The Sims 3 games, visit the www.TheSims3.com. The Sims is headed to Facebook! Play with friends, play with life, play with The Sims this summer on Facebook! The Sims Social will allow you to create Sims, build a bachelor pad or dream house, spark friendships and romances, have exciting adventures, and more – all with your Facebook friends. Learn more and ‘Like’ The Sims Social today by checking out the game’s Facebook Page Today! The Sims 3 at E3 Random Giveaway! It's the week of E3! Throughout the week we will be hosting a random giveaway on our Twitter. Tweet with us and use the hashtag "#TS3atE3" and Follow the official The Sims 3 Twitter for a chance to receive goodies. Random recipients will be announced each day throughout the week. The Sims 3 Store Spring Cleaning Sale - Last Chance to Claim A Few Great Sets! Spring Cleaning is here! The Sims 3 Store will be removing a few sets from its shelves to make room for some exciting new stuff. On June 13, the following sets will no longer be for sale: Ultra Lounge, Asian Fusion, Bayside and Storybook . Hurry now to The Sims 3 Store to claim these great sets at a discount while you still can. The Sims 3 at E3! We will be blogging live at the Electronic & Entertainment Expo this year! Follow us on Twitter and Like us on Facebook to be the first to hear the exclusive news and unveilings for everything The Sims 3 as well as more fun TS3 tidbits! There will also be hosting exclusive giveaways to those that Tweet/post with us throughout the day. We look forward to sharing all the juicy news with you! ***In North America and Europe according to NPD data, Chart-track UK, Gfk France, Gfk Spain, Gfk-MCC Germany and EA internal estimate. The Sims™ franchise, the groundbreaking game series that allows players to create and live a virtual, simulated life on a computer, celebrated its ten year anniversary in 2010 with an impressive more than 125 million units sold since its launch in February 2000. Now translated into 22 different languages and available in 60 different countries, The Sims series has quickly become a universal gaming and cultural phenomenon. Since its June 2009 launch, The Sims 3 has sold more than 10 million copies worldwide across multiple platforms and was the #1 best-selling PC title for 2009 in North America and Europe. Fan intensity is evidenced through nearly 250 million downloads of player created content including: The Sims characters, houses, stories and more. The Sims 3 community site, www.thesims3.com, welcomes up to seven million unique visitors monthly, handles more than 240 content downloads every minute and more than 3.5 million uploads have been made to date, including 11 movies each hour. The Sims 3 YouTube Channel is within the top 10 most viewed sponsored channels of all time with more than 45 million video views. Visit The Sims 3 official website to see what the players are creating at www.TheSims3.com or the official YouTube Channel for The Sims at http://www.youtube.com/user/TheSims. The Sims 3 is available for PC, Mac, iPhone®, iPod touch®, mobile devices, PlayStation®3 computer entertainment system, Xbox 360® videogame and entertainment system, Nintendo DS™, Wii™, and Nintendo 3DS. Join The Sims 3 Facebook or Twitter communities at www.facebook.com/thesims3 and www.twitter.com/thesims3. Electronic Arts (NASDAQ:ERTS) is a global leader in digital interactive entertainment. The Company’s game franchises are offered as both packaged goods products and online services delivered through Internet-connected consoles, personal computers, mobile phones and tablets. EA has more than 100 million registered players and operates in 75 countries. In fiscal 2011, EA posted GAAP net revenue of $3.6 billion. Headquartered in Redwood City, California, EA is recognized for critically acclaimed, high-quality blockbuster franchises such as The Sims™, Madden NFL, FIFA Soccer, Need for Speed™, Battlefield, and Mass Effect™. More information about EA is available at http://info.ea.com. The Sims and Need for Speed are trademarks of Electronic Arts Inc. Mass Effect are a trademark of EA International (Studio and Publishing) Ltd. John Madden, NFL and FIFA are the property of their respective owners and used with permission. KINECT, Xbox and Xbox 360 are trademarks of the Microsoft Group of Companies and are used under license from Microsoft. “PlayStation” is a registered trademark of Sony Computer Entertainment Inc. Wii and Nintendo 3DS are trademarks of Nintendo. iPhone and iPod touch are trademarks of Apple Inc., registered in the U.S. and other countries. All other trademarks are the property of their respective owners. Join The Sims 3 at E3 2011 with Executive Producer – Ben Bell – as he introduces The Sims 3 Pets. Learn how life is better with pets in The Sims 3! Take advantage of this opportunity to get up-close with Ben during the Q&A session where he’ll be answering questions from you! As a treat, a never-before-seen exclusive will be unveiled as well! We will be hosting a giveaway on Twitter following the live broadcast for Simmers who participate! The Sims 3 Pets E3 gift bundle will include a signed t-shirt from Ben Bell and a The Sims 3 Pets spiked human dog collar. Sign up for a reminder here! Celebrate The Sims 3's 2nd Birthday! We've just turned 2 and we would love for you to celebrate with us! We are hosting several events throughout the month. You can enjoy the activities at the comfort of your own home. If you share your TheSims3.com username on this Event Wall you could be randomly selected to be gifted a Store item! Just Arrived, All-New Summer Styles for Your Sims! If only everyday were Summer and Summer were everyday. Get the hippest new fashions of the season with the all-new Everyday - Hot Summer Days Set. Looking for new stuff? For the first time ever, your Sims can receive all-new interactions and exclsuive game benefits with our new premium content from The Sims 3 Store. Check out the Sharper Sim Foot Massager Chair today to see how premium content will allow your Sims to Live Better, Look Better, and Play Better! Take the fresh new looks to the bedroom with the brand new Contemporary Comfort Bedroom Set and give your Sims contemporary styles in it's most comfortable form for the room that deserves it most -- the bedroom! Expand the contemprorary styles to the living room with the all-new Contemporary Comfort Living Room Set and your Sims will be able to take in the summer season in style! Or, you can get everything new for the month of June with just one click! The June 2011 Compilation includes the Contemporary Comfort Bedroom, Contemporary Comfort Living Room, 'Everyday - Hot Summer Days' Sets and the Sharper Sim Foot Massager Chair. Check Out the New Looks Today!